Knitting needles come in all kind of sorts and sizes for different purposes. These are the old needles I worked with in the past. I am sure they are still used a lot, and there is nothing wrong with them, but I don’t use them anymore. I used them by locking the backsides under my arms, but I discovered I have more possibilities with circular needles. But you will read about these further in this article. 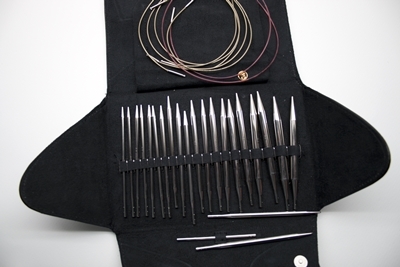 These needles are used for working in the round. I will use the short term DPN from this point on to make a difference with other needles used for working in the round shown further in this article. On the left you see metal DPN’s, on the right bamboo. Metal is very slippery, which is a disadvantage in this case. The stitches slide off the needle quite easily, there is no knob to prevent them sliding off. When I use DPN’s, I use my bamboo needles. These are slippery enough to work comfortably, but the stitches have got more hold and won’t slide off very easily. Quite ideal. These circular needles have a connecting cable of flexible material. I use these needle for almost al of my knitting. You can hold them in your hand comfortably, you can put a lot of stiches on the cable (depending of the size of the cable of course) and you can let your work rest in your lap while knitting. This really releases tension in your neck and arms. Maybe you have to get used to it when you’ve always worked with long needles, but once you are used to it, you don’t want to go back any longer. On the left you see wooden needles, in the middle bamboo and on the right metal needles. What is very important with your choice of needles is the attachment of the cable to the needles. If this is not smooth, you will suffer from difficulties all the time when you have to move stitches from the cable to the needles. This really is a great set. These are Addi knitting needles. This set contains loose needles, loose cables and extension parts. The cables can be connected to the needles through a simple clicking system. The needles and cables can also be bought seperately. Quite ideal!